Many of the Park Scholarships programs’ strongest partnerships began with a single connection. One exemplar of this is the Park Scholars’ work with DKMS (formerly known as Delete Blood Cancer), an international nonprofit organization dedicated to the fight against blood cancer and blood disorders. DKMS strives to increase awareness, recruit bone marrow donors, and raise funds to cover the costs of adding new donors to the registry. Over the past three academic years, Park Scholars have supported DKMS’ efforts by registering nearly 600 bone marrow donors – five of whom have since been matched with patients and completed the stem cell or bone marrow donation. 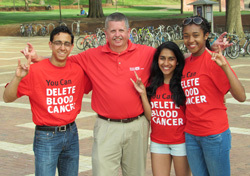 In 2014, Jodee Ruppel ‘05, U.S. director of donor recruitment for DKMS, suggested that her East Coast donor recruitment team manager, Bob Murray, partner with the Park Scholars to conduct bone marrow donor registration drives on NC State’s campus. With the assistance of Greg Wilson ‘10, an academic advisor at NC State and former Service Raleigh co-chair, Murray held the first of these donor registration drives in conjunction with Service Raleigh 2014’s kickoff event in Carmichael Gym. Later that spring, the Park Scholarships office put out a call to nonprofits with a local presence – Including DKMS – to submit project proposals for the Class of 2017’s Civic Engagement Initiatives (CEIs). CEIs introduce Park Scholars to community needs and how organizations operate to address those needs and effect positive change. Over the course of their sophomore year, scholars work in small groups with project sponsors to implement solutions to community challenges, building transferable skills along the way. 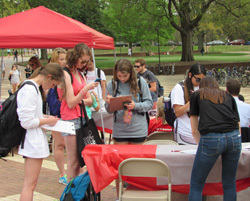 Murray charged his CEI team with coordinating a campus-wide bone marrow registration drive. Dard, Fernandes, and Williams reached out to NC State’s individual colleges, student organizations, and residence halls to build awareness of DKMS’ cause and encourage each unit’s constituents to participate in the donor registration drive. Fraternity and Sorority Life was especially supportive, and agreed to award points in their Greek Week competition to students who registered as donors. Delighted by the success of his CEI team’s donor registration drive, Murray sponsored another project for the Park Class of 2018’s CEIs. This time, he tasked Donnielle Jones ‘18, Carson Lay ‘18, and Neelam Modi ‘18 with registering greater numbers of African American, Native American, and Hispanic bone marrow donors, as these ethnic groups are significantly underrepresented on the national bone marrow registry. Ultimately, this CEI team hosted donor registration drives at Asian Focus NC’s 2016 Career Development Conference and NC State’s Pow-Wow, and forged strong new relationships between DKMS and key campus organizations. In the project summaries both CEI teams completed at year’s end, they cited communication, effective leadership, teamwork, and delegation as skill sets they sharpened while planning, marketing, and executing the bone marrow donor registration drives. Fernandes was similarly moved. Last summer, after completing her CEI with DKMS, she shadowed in Duke University Health System’s Blood and Marrow Transplant Clinic. There she saw firsthand the life-changing effects of receiving a bone marrow transplant. 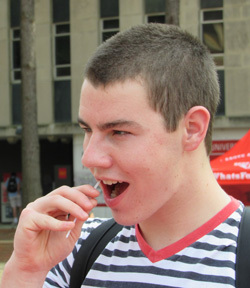 As part of the registration process, bone marrow donors swab the insides of their cheeks. In the meantime, Murray is proposing DKMS’ third CEI project, and hopes to work with another team of Park Scholars to recruit more bone marrow donors to the registry. He is inspired by the scholars’ past accomplishments, and particularly by the five student donors who were matched with patients in need. As donors remain on the registry until age 61, it’s possible that more donors who registered through Park Scholar-coordinated drives will save more patients’ lives in the future. “That’s what makes this program so exciting,” Murray said.